NEW YORK, NY--(Marketwired - Dec 3, 2013) - Madison Square Garden announced today that legendary music icon Billy Joel will become the first-ever music franchise of "The World's Most Famous Arena." 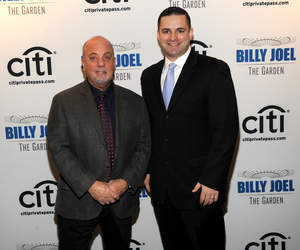 Joining the ranks of The Garden's other original franchises -- including the New York Knicks, Rangers and Liberty -- Billy Joel will kick off this franchise at The Garden performing a show a month, as long as there is demand, starting January 27, 2014. The first four previously announced shows -- January 27, February 3, March 21, April 18 are sold out. The just announced May 9 show, which is also Billy's 65th birthday, will be available to Citi cardmembers during an exclusive presale from December 4th at 10am (EST) through December 6th at 10pm (EST). Tickets will then be available for purchase by the general public beginning at 10am (EST) on Saturday, December 7th. "Since his first show in 1978, Billy has performed 46 shows at Madison Square Garden, including an unprecedented 12 consecutive sold-out shows that have earned Billy a spot among the Garden greats with a banner raised in his honor. Today, we take that relationship even further and are extremely honored to have Billy as The Garden's first music franchise," said James L. Dolan, executive chairman, The Madison Square Garden Company. "This new partnership will ensure that someone who has been such an important figure in our past, will also be a major part of our future. We welcome Billy home and look forward to many unforgettable nights of music at the Garden." "Today's announcement that Billy Joel is joining the Madison Square Garden family as their first music franchise is truly a momentous occasion," said Andrew M. Cuomo, Governor of New York. "It is particularly fitting that these two great icons are coming together to make entertainment history right here in New York. I offer my congratulations to Billy Joel and Madison Square Garden and the millions of fans worldwide who will benefit from this collaboration for years to come." "Performing at Madison Square Garden is a thrilling experience. I've played different venues all over the world, but there's no place like coming home to The Garden. Since my first show in 1978, I've always looked forward to the energy of the crowd. I'm honored to be joining the Madison Square Garden family and look forward to taking the stage of the newly transformed Garden to create many more memorable nights." Over its 130-year history, Madison Square Garden has become known as the preeminent venue for legendary artists and athletes. Billy Joel's first concert at The Garden was held on December 14, 1978 and, since then, he has performed an astounding 46 concerts at the Arena. In 2006, with 12-consecutive performances, Billy Joel broke the Garden's record for "Longest Run of a Single Artist." To commemorate this historical moment, a banner featuring "Joel - 12" was raised to The Garden rafters, and now hangs alongside other Garden legends such as Mark Messier, Rod Gilbert, Walt "Clyde" Frazier, Bill Bradley and Willis Reed. Billy Joel is one of the highest grossing touring artists in the world. Having sold more than 150 million records over the past quarter century, Billy Joel ranks as one of most popular recording artists and respected entertainers in history. Throughout the years, Joel's songs have acted as personal and cultural touchstones for millions of people, mirroring his own goal of writing songs that "meant something during the time in which I lived ... and transcended that time." The singer/songwriter/composer is the sixth best-selling recording artist of all time and the third best-selling solo artist. In December, Billy Joel will receive The Kennedy Center Honor, one of the United States' top cultural awards. New York's quintessential son performed at the historic 12.12.12 The Concert For Sandy Relief, joining other music greats to raise awareness and money to help those affected by Hurricane Sandy. Billy Joel was honored by Steinway & Sons with a painted portrait that hangs in Steinway Hall in Manhattan, making him the first non-classical pianist to be immortalized in the collection. He played to more than 110,000 fans when he performed the final concerts at Shea Stadium, featured in the 2010 documentary film "The Last Play At Shea." Billy Joel has received six GRAMMY® Awards, including the prestigious Grammy Legend Award. He has been inducted into the Songwriter's Hall of Fame and the Rock and Roll Hall of Fame and has received numerous industry awards. His music has also served as the inspiration and score for the hit Tony Award-winning Broadway play "Movin' Out." MSG now offers a rich visual history of Billy Joel and his many Garden performances through a scrollable timeline, featuring archival images, video insights from Billy, sharable images and lyrics, plus direct links for ticketing. Visit billyjoelmsg.com for more information. Join the conversation with #BillyJoelMSG. Tickets for the May 9, 2014 Billy Joel performance at Madison Square Garden will be available to Citi cardmembers during an exclusive presale from Wednesday, December 4 at 10am through Friday, December 6 at 10pm. Tickets will then be available for purchase by the general public beginning at 10am on Saturday, December 7 via ticketmaster.com and by calling 800.745.3000. Prices range from $64.50 to $124.50. The remaining shows will be announced later this year. Tickets will also available at the Madison Square Garden Event box office on Sunday, December 8, 2014. The concerts are being promoted by MSG Entertainment in association with AEG and Q104.3 as a media partner. The Madison Square Garden Company is a fully integrated sports, media and entertainment business. The Company is comprised of three business segments: MSG Sports, MSG Media and MSG Entertainment, which are strategically aligned to work together to drive the Company's overall business, which is built on a foundation of iconic venues and compelling content that the Company creates, produces, presents and/or distributes through its programming networks and other media assets. MSG Sports owns and operates the following sports franchises: the New York Knicks (NBA), the New York Rangers (NHL), the New York Liberty (WNBA), and the Hartford Wolf Pack (AHL). MSG Sports also features the presentation of a wide variety of live sporting events including professional boxing, college basketball, bull riding and tennis. MSG Media is a leader in production and content development for multiple distribution platforms, including content originating from the Company's venues. MSG Media's television networks consist of regional sports networks, MSG Network and MSG+, collectively referred to as MSG Networks; and Fuse, a national television network dedicated to music. MSG Networks also include high-definition channels, MSG HD and MSG+ HD, and Fuse includes its high-definition channel, Fuse HD. MSG Entertainment is one of the country's leaders in live entertainment. MSG Entertainment creates, produces and/or presents a variety of live productions, including the Radio City Christmas Spectacular featuring the Radio City Rockettes. MSG Entertainment also presents or hosts other live entertainment events such as concerts, family shows and special events in the Company's diverse collection of venues. These venues consist of Madison Square Garden, The Theater at Madison Square Garden, Radio City Music Hall, the Beacon Theatre, the Forum in Inglewood, CA, The Chicago Theatre, and the Wang Theatre in Boston, MA. More information is available at www.themadisonsquaregardencompany.com.